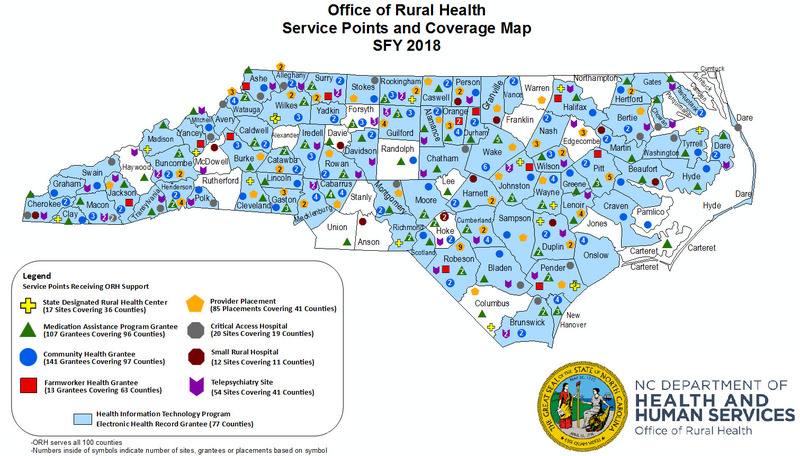 Provider Recruitment and Placement attracts medical, dental and psychiatric health professionals to North Carolina's underserved areas and offers financial incentives to eligible providers. Rural Health Centers create access to health care for vulnerable populations by supporting state designated rural health centers. Community Health Program supports the primary care Safety Net system to increase access for vulnerable populations. NC Farmworker Health Program provides medical, dental and enabling services to members of the North Carolina agricultural labor force and their families. NC Rural Hospital Program funds projects for the benefit of all critical access hospitals and eligible small rural hospitals in NC. Medication Assistance Program provides free and low-cost medications donated by pharmaceutical manufacturers to patients who cannot afford them. Statewide Telepsychiatry Program supports the psychiatric evaluation of patients through videoconferencing technology in emergency departments. Analytics and Innovations Program assist ORH programs and grantees with using data and leveraging technologies in ways that help improve monitoring, evaluation efforts, and innovative strategies. Integrated Health Systems (Ended 2018) provide technical assistance to communities and Safety Net providers seeking to improve access for vulnerable populations. Examples include strategic planning and health care integration.